It’s true that we don’t have a special magic wand that we use in our red stain removal process, but you might think so by the way we’re able to make those red stains disappear. Red stain removal is another one of our specialty stain removal services that are pretty popular with both residential homes and commercial accounts. When The Carpet Chemist receives a call for red stain removal, we put on our lab coats, roll up our sleeves and get to work. Send us a pic of your damaged carpet in the form below, and get a FREE estimate in under 15 minutes! The Carpet Chemist doesn’t use a one size fits all approach when it comes to taking care of your expensive carpet and rugs. 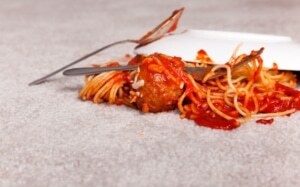 Red stains on wool carpet are treated much differently than a red stain on nylon carpet. Our BIG Carpet Chemist vans are stocked full of solutions and dyes meant for virtually any fabric type. Find out what customers are saying about our cutting-edge process and five-star service! We’d love to give you a free quote right over the phone at(800) 515-1342, or you can request a carpet consultation online. Your email is safe with us. We respect your privacy and will never sell or share your information with third parties!